Across the last sixteen years, Spider-Man has had his story told, re-told, and then re-told again on the big screen, always with the same humble origins, the same spiritual advice about what comes with great power, and sometimes with the exact same villains he has to fight so he can save the day. It’s a problem that even the MCU partially struggled with, because everyone and their Aunt Mays knows how Spider-Man came to be, and it’s very difficult to find a variation on the character that the vast majority of people haven’t seen before. The answer, however, may have been so simple this whole time; by reaching into the rich history of the many alternate comic-book versions of Spider-Man, outside of just Peter Parker, the possibilities are endless. By also making it animated – and boy, is it ever – those possibilities seem more real than ever, and it has resulted in Spider-Man: Into The Spider-Verse which is by far the greatest movie about the superhero to date, and quite frankly one of the best animated movies that has come out in a long, long time. We are introduced to a world where there is a Spider-Man already swinging about New York (and played by Chris Pine in an amusing vocal cameo), but he’s not our focus here. Instead, we meet Brooklyn teenager Miles Morales (Shameik Moore), the son of an African-American cop (Brian Tyree Henry) and a Puerto Rican nurse (Luna Lauren Velez) who – as per the Spider-Man lore – is bitten by a radioactive spider and develops the standard powers of the web-slinger, including a couple new ones including turning invisible. 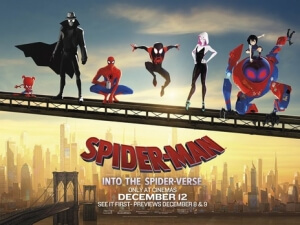 However, when Miles stumbles upon a plot by dastardly crime lord The Kingpin (Liev Schreiber) to open up a portal to multiple universes, he finds himself coming into contact with a whole group of other Spider-Men, including a chubbier and more world-weary Peter Parker (Jake Johnson), a headstrong Gwen Stacy (Hailee Steinfeld), a black-and-white detective Spider-Man Noir (Nicolas Cage), an anime girl named Peni Parker (Kimiko Glenn) and her fighting robot, and even a cartoon pig named Spider-Ham (John Mulaney). It’s quite a lot for Miles to take on board, especially when he’s just starting to grip with his own newfound powers, but he must find his own path if he is to set things right and become the hero of his own universe. It takes so much of what we think we know about Spider-Man as a character and completely starts over from scratch, offering an origin story – or in this case, multiple – that feels fresh and exciting once more, mainly because these are characters and stories we haven’t seen done so many times prior. We all know who Peter Parker is, but not many know about Miles Morales or any of the other iterations seen in this film, and what this movie is so good at doing, especially with the key Morales story, is giving us enough time with these characters to know who they are, how they interact with people, and why they do what they do. They make these characters fun, likeable and incredibly unique to what we always associate the character of Spider-Man to be; Miles is an incredibly likeable young hero who ends up going through some pretty heavy dramatic moments throughout the film, but they never feel out of place or tonally inconsistent because they come from a character you’re eager to follow and root for in the face of danger. There are tons of characters who you can enjoy in several different capacities, which is something I haven’t truly felt about an animated film since probably The LEGO Movie; a fitting statement, seeing how both Phil Lord and Christopher Miller had a hand in making this (largely in a producing capacity, though Lord did write the script with co-director Rodney Rothman), and watching its rapid-fire and borderline-meta sense of humour you can absolutely tell this was a Lord/Miller production, and luckily it’s another great one to add to their increasing list of credits. This movie also has some of the most stunning and unique animation I’ve ever seen in a movie like this, with a pop art design to it that feels like we’re truly watching a comic-book spring to life (you can just about see the lines and dots in every last detail, not to mention sound effects translated into words as per a traditional comic-book), and very intricate pacing to this CG animation that makes it look and feel like it’s hand-drawn half the time. This animation makes for some stunning shots that make some of this year’s live-action fare look relatively tame by comparison, and even at times when it threatens to become way too chaotic to keep paying attention, it’s still gorgeous and even kind of trippy to look at, setting itself an entirely new standard that many other animated movies can’t, and probably won’t, be able to live up to. Pay attention, too, to how most characters are animated in different ways, with Miles Morales, Peter Parker and Gwen Stacy being rendered like sophisticated graphic novel drawings, Peni Parker animated like she really did just step out of a Studio Ghibli anime, and Spider-Ham looking and feeling like a lost Looney Tunes character; details like those are intricate and way too tricky to the most basic of animators, but the entire animation team behind this movie deserves its own Oscar for achieving the cinematic impossible (though while we’re on the subject of the Oscars, I swear that if this film is LEGO Movie’d this year by the Academy, then I will have lost all faith in that particular category). Outside of it being a fantastic Spider-Man movie – again, perhaps the best that has ever been made – it’s a truly amazing movie, with great characters, strong writing (both comedic and dramatic), and a beautiful artistic design that truly makes this a spider for the ages. Spider-Man: Into The Spider-Verse is perhaps the greatest movie yet made about the Marvel web-slinger, with the cinematic introduction of some great new characters into the Spider-Man lore, and an absolutely breathtaking animation style that’s in a league of its own. It’s by far the best animated movie of the year, and also one of the year’s very best.